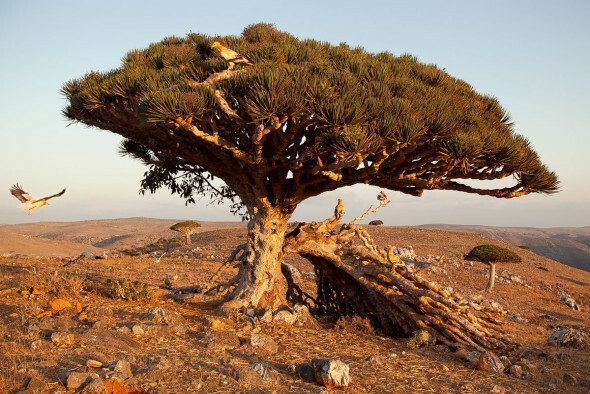 Ever heard of Socotra, Yemen? 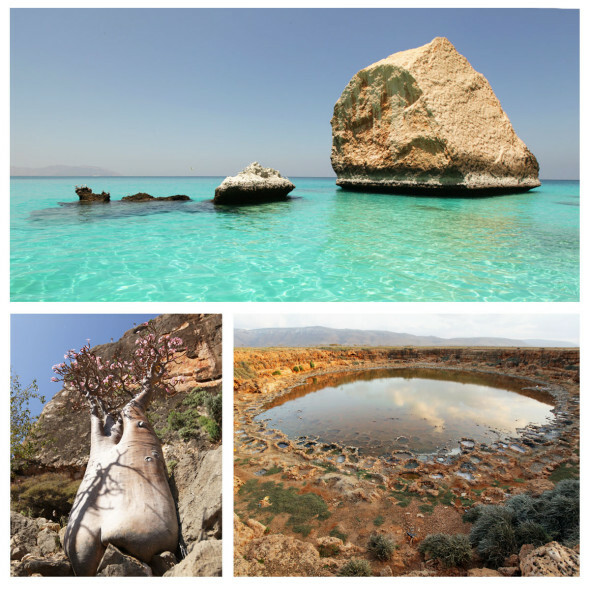 This isolated island in the Gulf of Aden (Indian Ocean) is often referred to as “the Galapagos of the Middle East” because of its unique biodiversity — some 700 species of flora and fauna are endemic to the island and found nowhere else on the Earth. This is a consequence of its remote geography: It lies 240 km east of the Horn of Africa and 380 km south of the Arabian peninsula — making it the most isolated island of non-volcanic origin. 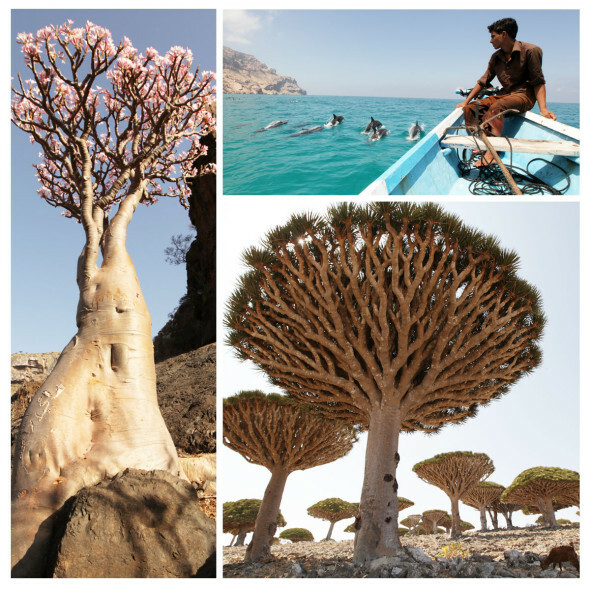 Characteristically-shaped crowns of dragon blood trees (dracaena draco) and trunks of the bottle-shaped desert roses (adenium obesum) make the island landscape an unusual and unearthly sight that has drawn the attention of National Geographic photographers and amateur nature lovers alike. When one hears about the Gulf of Aden, the first thought that comes to mind for many are Somali pirates. Indeed, pirates are a reality on those waters and Socotra a familiar spot for corsairs. The Oscar-nominated movie “Captain Phillips” (2013) tells of a real-life pirate story with a connection to Socotra. Starring Tom Hanks (Captain Richard Phillips) and Barkhad Abdi (Abduwali Muse (Somali pirate leader)), the movie is based on the true story of the 2009 Maersk Alabama hijacking in the Gulf of Aden. Luckily for us, we did not encounter any pirates on the island when we ventured there for our botanical adventure in March 2014, although the island has been known to serve as a base for Somali pirates, as well as a resting point for African migrants seeking (illegal) entry into Europe through maritime routes. We were welcomed on the island by yellow-headed Egyptian vultures (a.k.a. “pharaoh chickens”), who quickly found us at our first meal stop of the trip and would become a regular (and welcomed) part of our island experience. Not only are the vultures beautiful, but they also provided us with ample opportunities for stellar photos! “It doesn’t get any more basic than that”, said Fajer, our tour organiser (check our review of Escape Travels amongst other tour operators we have tried and tested), as we lounged at our first stop of the trip after our lunch (where we had befriended the pharaoh chickens) in the shade of a beach hut built of barasti and coral rocks. But “basic” in this context could have been substituted by “beautiful” or “serene”. The waters in front of us were deep blue and packed with coral reef, walking fishes (a.k.a “mudskippers” or “Darwin fishes”) and all sorts of crabs. But after our hearty lunch and an early morning flight commencing at 4 AM from Sharjah and finishing at Socotra (11 AM) via mainland Yemen, our attention was focused on catching 40 winks in the shade. We spent our first night in a tent in the shadow of 300-metre-high snow-white sand dunes made of coral powder. (If not for the 30+ Celsius weather they would have been mistaken for snow.) To our amazement, we learned that the dunes are a blown in from the coast — quite a testament to the power of wind given the scale of the dunes! Some of us even tried to reach the summit of the dunes, but were stopped short by strong winds that blew sand in our face and choked our every breath above 200 metres. From our campsite we glimpsed two massive caves, elevated several hundred metres above our heads, carved inside the facade of the granite and limestone mountains. Like much of the landscape of the island, it was at once inviting yet foreboding. So it was too our relationship with the animals: Though the ubiquitous crabs (and their dunes) were a welcomed sight on the beach, we heeded the advice of Fajer and zipped up our tent tightly to avoid them (and other visitors) when it came time sleep. In the safety of our tent, we were lulled into a state of sleep by the repetitive sound of the ocean waves making landfall on one end and the quiet emptiness of the mountain on the other. For the next few days we embarked on a botanical odyssey, hugging desert roses and scaling dragon blood trees, dipping into wadis to cool off from the sun, and sharing the waters of the ocean with dolphins and other marine creatures. Nights gave us campfires and the opportunity to view the stars and the Milky Way in raw nature. And what connected the two phases were deep orange-red sunsets and sunrises that painted the dragon blood trees with a warm orange hue. All of this was enjoyed in a back-to-basics context, lacking the comforts of running water or washrooms. Despite the basic living conditions on the island — per capita GDP (PPP) in Yemen is just $2,249 — we were served by our hosts a veritable feast every day of fish or meat and rice. Vegetables were also flown in from the mainland just for us to add variety to the heavy Yemeni cuisine. But perhaps the highlight was a meal of goat meat made fresh for us, slaughtered in the shade of a dragon blood tree and prepared over an open fire. Our appetite for the goat meat was rivalled only by the pharaoh chickens who fed on the goat offal under the dragon blood tree where it was sacrificed. 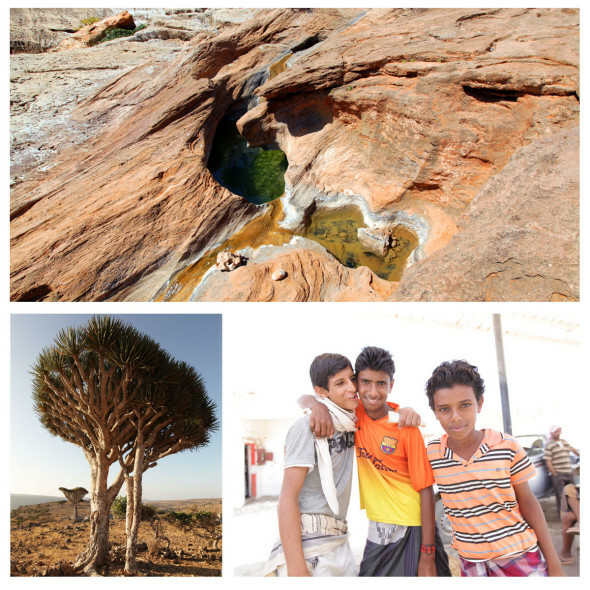 When the trip ended, and we returned to Dubai, we felt an immediate pang to go back to a life of simplicity on Socotra. Indeed, when we reverted to sleeping on the comfort of our bed back in our Dubai apartment, we felt a certain longing for “cozy” rocks to “massage” our backs, although we did not miss the buzz of snoring from neighbouring tents. We absolutely loved every aspect of this trip: Pristine beaches and blue waters; picturesque wadis perfect for swimming; dolphins playing in the bay; crabs crawling on the beach (but luckily not in our tent); fresh Yemen honey for breakfast; dragon blood trees and desert roses rising from the ground; goats foraging at all four points of the island; vultures scavenging at the meal sites; friendly locals sharing their culture (including music and dancing by veiled Yemeni women! ); etc. However, there was one aspect which we felt uneasy about: Was our presence on the island damaging the delicate balance? Will the fragile ecosystem be able to survive the intrusion of tourists (even if done in an eco-friendly manner)? Will humans be able to preserve this timeless island? Already, there are signs of modern life encroaching on the land: Power lines by the side of the highway; plastic bags littered about in areas of human settlement; etc. Yet, we did see hope for positive elements from humanity. For example, a botanical nursery that raises dragon blood trees until they are big enough (~20 years old) that they are safe from the voracious appetite of the goats, and which are then allowed to flourish in the dragon blood tree preserve/park. This entry was posted on Tuesday, April 8th, 2014 at 3:11 pm. It is filed under Africa, Middle East, Recent Articles. You can follow any responses to this entry through the RSS 2.0 feed. Sokotra — czyli sen o utraconym raju. Czy słyszeliście kiedyś o Sokotrze? Jest to wyspa położona na Ocenie Indyjskim należąca do terytorium Jemenu często nazywana jest Galapagos Bliskiego Wschodu, pełna endemicznych gatunków roślin i zwierząt. Charakterystyczne korony drzew draceny smoczej(Dracaena draco) oraz róże pustyni (Adenium obesum) o butelkowym kształcie pnia nadają wyspie nieziemskiego wyglądu i przyciągają tu zarówno fotografów z National Geographic jak i amatorów przyrody z odległych zakątków świata. Zatoka Adeńska słynie z aktywności somalijskich piratów. Jakkolwiek bajkowo to brzmi, obecność korsarzy na tych wodach jest obecnie jak najbardziej rzeczywista. Nominowany niedawno do Oskara film „Kapitan Phillips” opowiada historię pirackiego ataku na kontenerowiec morski, opartą na faktach autentycznych. W filmie występują Tom Hanks jako tytułowy bohater oraz niesamowicie przekonywujący Barkhad Abdi (aktor o somalijskich korzeniach) jako dowódca pirackiej bandy. Jak wieść niesie, piraci jeszcze do niedawna stacjonowali na południowym wybrzeżu Sokotry, dokąd wybraliśmy się w naszą botaniczną odyseję. „Trudno o bardziej spartańskie warunki” – stwierdza Fadżer, organizator wycieczki podczas odpoczynku w cieniu chaty zbudowanej ze skały koralowej i liści palmowych na wybrzeżu oceanu. Otacza nas rafa koralowa, amfibie, zwane również rybami Darwina oraz zadziwiająco przyjazne żółto-głowe sępy egipskie zwane potocznie „kurczakami faraona”. Sępy czekają cierpliwe na resztki naszego posiłku. Pierwszą noc spędzamy w namiotach wtulonych w podnóże gigantycznych wydm utworzonych z nawiewowego pyłu koralowego pomiędzy wietrznym wybrzeżem a stromym skalistym klifem. Mniej więcej w połowie wysokości tej granitowo-osadowej ściany, z wysokości około 200 metrów, zerkają na nas kuszące, ciemne oczy głębokich jaskiń. Wieczorem zamykamy szczelnie namioty aby uniknąć wizyty nieproszonych nocnych gości – krabów. Obserwując doskonale widoczną drogę mleczną przez lufcik w suficie namiotu odpływamy w sen.
Zaledwie kilka dni spędzonych z dala od cywilizacji, gdzie bieżącą wodę dostarczają naturalne baseny z górskich jaskiń oraz strumienie w dolinach wadi, a powietrze jest tak przejrzyste, iż gwiazdy wydają się być na wyciągnięcie ręki, wprawiło mnie w nostalgię za prostym życiem. You are the proof that dreams DO come true! Your destiny is to travel and tell stories about it. Thank you for bringing such great places to my attention.